Of course, access does not reflect actual use. In a survey of 754 teens last November-December, we found that 73% of youth ages 12-17 use the Internet. This is a high figure, but it is important to compare it to the fact that there is access to the Internet for virtually all teenagers at their schools. A significant number of teens should be able to go online at school, but do not or cannot do so. About two-thirds (64%) of the wired teens we interviewed say they have gone online at one time or another from school. The vast majority report their primary access to the Internet is at home and that is the place they most frequently go online. About 11% of these wired teenagers say their primary access to the Internet is at school. Our survey suggests that school is often the place where those who are less privileged have their primary access to the Internet. That includes of children of single parents and those from low-income families. Most teenagers say the Internet’s ability to help them with their schoolwork and to help them learn new things is one of its best features. This potential role as educational tool is often the primary reasons why families get Internet access. Three-quarters of online teens (78%) say the Internet helps them do their schoolwork—47% say it helps them a lot. The Internet has also revolutionized many time-honored short cuts to completing assignments. For a fee, interested readers can download branded study aids from the Internet, or search for free Web pages with the content they need. One-third (34%) of all online teens have downloaded online study aids. Older teens—those ages 15 through 17—are more likely to have downloaded study aids from the Internet than younger teens (39%, compared to 27%). Older girls and youth who go online every day are among the heaviest users, with 41% of each group saying that they have downloaded Cliff’s Notes, Monarch Notes or other study guides from the Internet. When asked to think about the last big report they wrote for school, 71% of online teens reported relying mostly on Internet sources for their research. Another quarter (24%) reported using mostly library sources, and 4% said they used both equally. Older teens were slightly more likely than younger ones to report relying on Internet sources; 74% of those ages 15-17 relied on the Internet for their most recent project, compared to 68% of those ages 12-14. And three-quarters of youth who go online every day used the Internet as their main source for their last school report, compared to 68% of youth who go online less often. Students cite the ease and speed of online research as their main reasons for relying on the Web instead of the library. For instantaneous help with vexing homework, online teens at times turn to friends, classmates, and teachers via instant messages or email. Forty-one percent of online teens say they use those communication tools to contact teachers or classmates about schoolwork. “We talk about school [online] sometimes,” noted a 17-year-old girl in a February online discussion group conducted for the Pew Internet Project by Greenfield Online. “If we need help on homework, it’s great because you can get 3 or 4 people working on a really tough problem together.” Close to half of online girls (47%) report email or instant messaging classmates or teachers about schoolwork, as do 36% of online boys. Older teens are more likely to report consulting friends or teachers online about schoolwork. And a substantial majority of teens who go online daily (60%) report emailing or IM’ing others about homework. Teachers are also starting to incorporate the Web into their classroom work. Seventeen percent of all youth have created a Web page for a school project. Younger teens (12 to 14) are more likely to have done this than older teens—20% of teens ages 12 through 14 have ever made a Web site for a school assignment, compared to 15% of teens 15 to 17. The ease of gathering information on the Internet has a darker side. The simplicity of finding out things on the Web also makes it easy for students to cheat. Cutting and pasting text from a Web site and into a paper is effortless. So is wholesale copying or purchasing finished essays or reports. 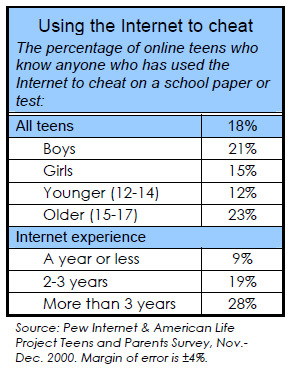 About a fifth of online youth (18%) say they know of someone who has used the Internet to cheat on a paper or test. While 9% of those who have been online for a year or less know someone who has cheated, 19% of those who have been online for 2 to 3 years and 28% of those who have been online for more than three years know people who have used the Net to cheat. What is a “homework help” site? The sites we studied served a variety of purposes, from online tutoring to term papers written by other students. Homework help sites also range in price, in scope, and in the age group to which they cater. Almost every homework help site specifies what age group or grade level it is intended for. Most of the sites explored catered to middle school (grades 6-8) or high school (9-12) students. Thirty-three of all 100 sites were intended at least in part for use by college students, and twenty-eight of the 32 essay sites in this survey claimed they were created expressly for college students. The smallest number of sites are geared toward elementary school students. These sites offer a collection of links to other sources of research or information. Links are usually organized by subject (i.e. English, Biology, American History), and vary in number from site to site. Research portals such as these have become increasingly common, collecting a number of reference materials at one convenient location. The best compilations have a variety of topics, a multitude of interesting links, and contain few or no broken hyperlinks. Some 37 of the sites we surveyed were collections of links. While less common than the basic portals, 20 of the sites we examined offered their own articles or information. Rather than refer the user to another source for help, they use sample problems, book summaries, or encyclopedia-style articles to aid students. Almost one-third of the sites surveyed in this project dealt with buying, selling, sharing, or downloading essays or term papers. Although it is clear that some sites would tempt a student to download a paper and claim it as his own, to avoid legal issues, nearly all of these sites have disclaimers. NoCheaters.com, a Web site that sells pre-written papers for $9.85 a page, maintains that its papers should be used as models only, stating, “NoCheaters.com does not service those who wish to cheat, copy, steal, or plagiarize.” The site is at: http://www.nocheaters.com/custompapers.html. Some essay databases, however, make little effort to hide their true aims. Cyber Essays (www.cyberessays.com) posts the following statement: “Cyber Essays is here to challenge the lazy teacher into helping her students and [giving] assignments from which the students can learn.” As a counterpoint, services like TurnItIn.com (at http://www.turnitin.com/new.html) allow teachers to check a student’s work against the thousand of essays and reports available online. And as teachers and the Web sites themselves warn, students who make use of such sites should know that their teachers can access the stock of essays as easily as the student. Once a student gains access to a Web site’s essays, he or she may discover that their quality leaves something to be desired. Blaine Vess, creator of Other People’s Papers (www.oppapers.com), was cited in a recent Denver Post article as estimating that about 20% of the essays on oppapers.com would receive a grade of a D or an F.
Another common type of homework help site includes online tutoring services, and ask-an-expert services that enlist teachers or other volunteers to answer students’ questions via chat or email or instant message. Many of the ask an expert sites are free, while the online tutoring Web sites tend to work on either fee-for-service or subscription-based models. Sometimes for free, but more often for a fee, student users can download branded study aids that offer synopses and readers guides, usually to literature. 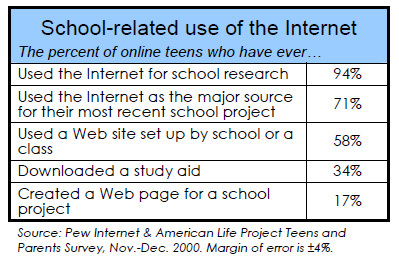 According to teens 12 to 17 that the project surveyed, 34% say they have downloaded online study aids. Sites like Britannica and World Book offer subscriptions to full online encyclopedias as well as few articles for free, mainly meant as teasers to get users to sign up for the free trial period. Others are styled as online libraries, allowing users to read, take online notes and create bibliographies from digital copies of books. Many library sites also work on a subscription-based model. A variety of offerings appear online. Some services provide immediate, interactive tutoring. For example, Herzog Interactive (http://herzoginteractive.com/) provides subscribers with a PC camera pack, two-way headset, and an electronic tablet. This gear comes free with each subscription to Herzog Interactive. Subscription rates are $185 per month or $1,665 per year. Who creates homework help sites? Private companies or organizations developed 61 of the sites studied in this survey. Of the remaining sites, individuals created about a third, and libraries established a few. While most sites, especially those created by private organizations, were highly polished and professional, a fair number of the homework help sites examined by the Pew Internet Project were amateur creations of teachers, parents, or students looking to help other students. The great majority of the sites reviewed offered their services for free to the user, supporting themselves via advertisements. The major advertisers included magazines, software makers, computer makers, telephone companies, insurance companies, e-tailers, and credit-card companies. Many of these sites want to track which students use their services by requiring students to register or by placing cookie files on their computers. Cookies are computer code that allows the site to track how a user moves through the site and often allow Web sites to track users as they move through many other Web sites. Out of 100 sites examined, 52 attempted to plant cookies on users’ computers. Adults, like teens, use the Internet to teach themselves new things or to satisfy their curiosity about a subject. Eighty percent of all Internet users have done an Internet search to find the answer to a specific question that they have, and 16% of adult Internet users go online on a typical day to get an answer to a question. Some users have pursued more formal education online. In recent years, universities and colleges have begun offering parts of their course catalogs as online courses. That and the development of exclusively online universities have allowed Internet users to take formal classes online. Five percent of Internet users report taking a class online for college credit, and five percent also report having ever taken any other kind of class online. People under age 50 and those with at least some college education are the most likely to have taken classes online. On any given day, 1% of Internet users are taking a class online. That amounts to about one million adults.